After forty minutes of scoreless play, the Ice Flyers bested the Mayhem in the closing 20-minute stanza and skated away with a 3-1 triumph on Saturday night. Having just been shut out by the Ice Flyers the previous night, the Mayhem came into Saturday night's tilt dead-set on finding a chink in Brian Billett's armor in the early going. Despite their best efforts, Pensacola's goaltender stood tall. The Flyers weathered the early storm and responded by heavily outshooting the Mayhem for the remainder of period one. Nevertheless, they could not solve Macon net-minder Kevin Entmaa. The rookie goaltender had been playing in just his second professional game, and stopped all 16 of the first period shots the Flyers sent his way. At the end of the period, Larry Smith was handed a four-minute double-minor penalty for high-sticking, and the Mayhem went to a long penalty kill which carried over into the second period. Macon successfully fought off the remaining time on Pensacola's power play, and would go on to kill another man-advantage midway through regulation. The best opportunity of the period came when Jake Trask redirected a point shot from in tight, but was denied by Billett on the goal line. Jimmy Soper had a chance at the very end of the middle frame, but attempted an extra pass which was nullified by the Ice Flyers' defenders. To start the closing period, the Mayhem had time remaining on a power play. Just 19 seconds into period three, Brett D'Andrea seized possession and raced down the Macon slot on a breakaway. His shot was turned aside by Entmaa, but the rebound found Joseph Drapluk, who fired the puck past the Macon net-minder to spoil his shutout bid. The Mayhem had a response just 4:14 later. Danny Cesarz entered the attacking zone right down the middle on an odd-man rush. He slammed on the breaks and ripped the puck past Billett, becoming the first player on the Mayhem all weekend to score on Billett. However, on a 4-on-4, the Flyers regained their lead when Eddie Matsushmia sniped a shot past Entmaa 7:55 into the third. Andrew Schmit would tally an empty-net strike from center ice in the closing minute to seal the game. Entmaa had another strong start, stopping 38 of 40 shots on goal. Billett denied 23 of Macon's 24 attempts to earn his 18th win of the season. 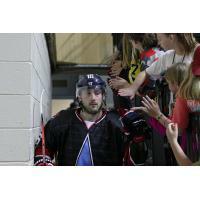 The Mayhem will return to the Macon Centreplex next weekend to host the Knoxville Ice Bears on Fan Appreciation Night. Puck drops at 7:35 pm EST.